Kaposi's Sarcoma (KS) is a proliferation of aberrant vascular structures lined by spindle cells, and is caused by a gammaherpes virus (HHV8/KSHV). Its course is aggravated by co-infection with HIV-1, where the timing of infection with HIV-1 and HHV8 is important for the clinical outcome. In order to better understand the pathogenesis of KS, we have analysed tissue from two AIDS-KS lesions, and from normal skin by serial analysis of gene expression (SAGE). Semi-quantitative RT-PCR was then used to validate the results. The expression profile of AIDS-related KS (AIDS-KS) reflects an active process in the skin. Transcripts of HHV8 were found to be very low, and HIV-1 mRNA was not detected by SAGE, although it could be found using RT-PCR. Comparing the expression profile of AIDS-KS tissue with publicly available SAGE libraries suggested that AIDS-KS mRNA levels are most similar to those in an artificially mixed library of endothelial cells and leukocytes, in line with the description of KS lesions as containing spindle cells with endothelial characteristics, and an inflammatory infiltrate. At least 64 transcripts were found to be significantly elevated, and 28 were statistically downregulated in AIDS-KS compared to normal skin. Five of the upregulated mRNAs, including Tie 1 and sialoadhesin/CD169, were confirmed by semi-quantitative PCR to be elevated in additional AIDS-KS biopsies. Antibodies to sialoadhesin/CD169, a known marker of activated macrophages, were shown to specifically label tumour macrophages. The expression profile of AIDS-KS showed 64 genes to be significantly upregulated, and 28 genes downregulated, compared with normal skin. One of the genes with increased expression was sialoadhesin (CD169). Antibodies to sialoadhesin/CD169 specifically labelled tumour-associated macrophages, suggesting that macrophages present in AIDS-KS lesions belong to a subset of human CD169+ macrophages. Kaposi's sarcoma (KS) was first described more than 120 years ago. This "classical" variant is rare and usually limited to elderly men, although an aggressive form was subsequently found to occur in young people in Africa designated "African endemic variant". KS is also observed in organ transplant recipient patients who have previously received immunosuppressive therapy designated "post transplant KS" . The fourth form "epidemic or AIDS-related" is KS associated with HIV-1 infection (AIDS-KS) . This variant is predominantly found in homosexual or bisexual men where it develops in 15–30% of patients during the course of infection. AIDS-KS is the most common tumour seen in patients with HIV-1 infection and can become widely disseminated with the involvement of visceral organs. A viral aetiology for KS has been suspected since the early 1970s. In 1994, Chang et al. identified two fragments of herpesvirus-like DNA in the lesions of a patient with AIDS-KS. Since this discovery of Kaposi's Sarcoma-associated Herpes Virus (KSHV), also named Human Herpes Virus 8 (HHV8), there is a strong epidemiological case for a causative role of this virus in the pathogenesis of all KS types . KS lesions have a complex histology, are localized to the dermis, and are characterized by a proliferation of aberrant vascular structures lined by spindle cells. Despite their morphological homogeneity, these KS spindle cells represent a heterogeneous population dominated by activated endothelial cells mixed with fibroblasts, macrophages and dendritic cells . Several histological features of KS lesions suggest that they represent polyclonal proliferations rather than true tumours, at least at the early stages. Genomic sequencing has revealed that HHV8 contains several genes with likely oncogenesis related functions that subvert pathways involved in cellular activation, proliferation, differentiation, and survival (see e.g. ). In contrast to the first three KS variants, a second virus, HIV-1, is involved in AIDS-KS. Although the mechanism is still unknown, HIV-1 infection greatly enhances the occurrence of KS in HHV8 infected patients. Earlier research indicated that the timing of infection with HIV-1 and HHV8 is essential for the clinical outcome. Patients seroconverting for HHV8 after HIV infection are at a higher risk to develop AIDS-KS than those who seroconvert for HHV8 before HIV infection [4, 7]. Genes differentially expressed in AIDS-KS could provide insight into disease progression, and provide molecular markers to monitor patients at risk. These genes should preferably also be differentially expressed between patient PBMCs and those of healthy controls for easier monitoring. Assuming the existence of such genes is not inappropriate, as both viruses are present in PBMCs , and cells with KS spindle cell properties can be grown from AIDS-KS patient blood [9, 10]. In an effort to identify such potential molecular markers for the development of AIDS-KS in HHV8/HIV-1 double-infected patients, we have analysed gene expression profiles of two AIDS-KS skin lesions with the serial analysis of gene expression (SAGE) technique. SAGE is a powerful technique that allows large-scale analysis of gene expression in a tissue of interest , including eventual viral transcripts. Comparison of the global gene expression patterns generated by SAGE to a control tissue would allow the identification of differentially expressed genes. Kaposi's sarcoma skin tissue was obtained from two homosexual male AIDS patients, living in The Netherlands. Patient 1 was demonstrated to be HIV-1 positive in 1982. In 1985 a histological examination confirmed the diagnosis of Kaposi's sarcoma. He died 13 month later and post mortem examination revealed morphological variants of visceral AIDS-KS. Patient 2 presented in 1984 at the AMC with progressive AIDS-KS skin lesions. Subsequently, internal organs were affected, and the patient died in 1986. Normal adult breast skin tissue was obtained as discarded tissue from reduction mammoplasties (obtained from the Department of Plastic Surgery of our hospital). RNA isolated of three breast reductions, mixed in equal amounts, was used to construct the normal skin expression profile library. Frozen sections were cut with a microtome, fixed with acetone and stained with mABs to CD3, CD31, CD68, or CD169/sialoadhesin. CD3, CD31, and CD68 antibodies were obtained from Dako (Glostrup, Denmark), anti-CD169 antibodies were from Serotec (Oxford, UK). SAGE libraries were constructed from frozen skin biopsies taken at autopsy from both AIDS-KS patients. The two biopsies were cut with a microtome in 10–14 μm sections for RNA isolation, while 5 μm slides were prepared for histological examination. Total RNA was isolated with the Trizol method (Life Technologies, San Diego CA, USA). Poly A+ mRNA was further isolated using the Micro-FastTrack 2.0 mRNA purification kit (Invitrogen, Carlsbad CA, USA). SAGE was performed as described previously . In brief, poly A+ RNA was converted to double-stranded cDNA with Superscript II RNAse H- Reverse Transcriptase (Life Technologies, San Diego CA, USA) and a primer biotin-5'-T18-3'. The cDNA was then cleaved with NlaIII, and the 3'restriction fragments were bound to streptavidin-coated magnetic beads (Dynabeads M280 from Dynal, Oslo, Norway). After ligation of oligonucleotides containing recognition sites for BsmF1, the linkered cDNA was released from the beads by digestion with BsmF1. The released tags were ligated to each other to create ditags, and amplified by polymerase chain reaction (PCR). Amplified ditags were subsequently concatenated and cloned into the Sph1 site of pZero 1.0 (Invitrogen, Carlsbad CA, USA). Colonies were screened by PCR, using M13 forward and M13 reverse primers, and inserts were sequenced with the Bigdye Terminator Cycle Sequencing kit (ABI, Foster City CA, USA) and analysed using an ABI 377 automated sequencer (ABI, Foster City CA, USA). Three SAGE libraries were constructed: KSa derived from AIDS-KS skin tissue of patient 1, KSb derived from AIDS-KS skin tissue of patient 2, and NS, a normal skin library derived from RNA isolated from three samples of normal skin. SAGE libraries have been submitted to Gene Expression Omnibus (GEO) at http://0-www.ncbi.nlm.nih.gov.brum.beds.ac.uk/geo/, with the following accession numbers: GSM3240 (KSa), GSM3241 (KSb) and GSM3242 (NS). Primary analysis of the SAGE libraries was performed with USAGE version2 . This program does initial analyses on raw sequence data, e.g. ditag and tag extraction, tag counting, and tag identification. Tags were identified with the SAGEmap database available through NCBI, to which USAGE is directly linked. Viral tags were identified with a SAGE tag database created for this project by extracting all relevant SAGE tags from the viral cDNA sequences present in the NCBI database http://0-www.ncbi.nlm.nih.gov.brum.beds.ac.uk/entrez. This viral tag database has been implemented in USAGE. The program USAGE was also used to compare taglists, and to do statistical analyses on tag count differences. Besides USAGE, the SAGE libraries were analysed with the Human Transcriptome Map (HTM) . In this program, tags have been mapped to 18,422 human genes and their respective chromosome locations. HTM identifies all possible tags of a single transcript at a certain chromosome position. For highly expressed genes, very often more than one tag is found in SAGE libraries, due to alternative splicing, and/or alternative polyadenylation. Additionally, the pooled KS library was compared with several public databases. Six SAGE tags were identified as more frequently expressed in AIDS-KS than in normal skin, and in all public SAGE libraries at the time of analysis (NCBI CGAP). The RNA preparations used to construct the SAGE libraries were further used for tag confirmation . RNA samples were treated with DNaseI (Roche Diagnostics, Almere, The Netherlands). First strand cDNA synthesis was primed with an oligo(dT)18 with a 5' M13 tail (5' ctgagttgtaaaacgcggccag-(t)18 -3') and transcribed with AMV-RT . For the PCR we used a tag specific primer consisting of 10 nt identified in the SAGE analysis with a 5'NlaIII restriction site (catg) and 5' inosine nucleotides to increase the annealing temperature of the primers and a 20 nt primer corresponding to the 5'tail of the oligo (dT) primer (5'ctgagttgtaaaacgcggccag-3'). PCR was performed using standard conditions . PCR fragments were cloned in a TA cloning system (Invitrogen, San Diego, CA,) and several clones were sequenced. A limited-dilution RT-PCR was developed for each of the six selected genes. The RT-PCR assays were nested PCR reactions, optimised to amplify 1–5 cDNA copies. Primers were obtained from Invitrogen Life Technologies (San Diego, CA). Primer sequences are shown in Table 1. To confirm specificity of the primer sets, the RT-PCR products were cloned and sequenced before testing of any patient material. Total RNA, isolated from five newly selected different AIDS-KS lesions, staining positive for HHV8 and CD31, and two normal skin tissue samples (both negative for HHV8 and CD31 staining), was DNase treated before use. DNA contamination was tested by a minus RT-PCR. All selected genes were normalized to the input RNA (500 ng), which concentration was measured by OD. The input RNA was diluted in 10-fold steps. HHV8 DNA and HIV-1 RNA were amplified as controls from patient material using nested PCRs . For the detection of HIV-1 RNA a nested RT-PCR was used . Normal skin samples were negative for both viruses (results not shown). All tissues were collected, snap frozen, and stored at -80°C. Histological staining was performed on the frozen tissue. Both AIDS-KS skin biopsies showed a similar histopathological picture of nodular advanced-stage Kaposi's sarcoma with irregular, dense areas of spindle cell proliferations (Fig. 1, panel D/G). Ziehl-Neelsen, grotcott and PAS staining showed the KS tissues to be negative for mycobacteria and fungi (data not shown). The control skin tissue had a normal morphology (Fig. 1, panel A). Histological staining of AIDS-KS and normal tissues Hematoxylin-eosin staining of normal skin tissue (panel A), and the two advanced-stage, nodular AIDS-KS tissues (panels D/G). Endothelial cells were stained with anti-CD31 (Dako) (panel B = normal skin, panels E/H = AIDS-KS tissue) and lymphocyte subpopulations were stained with mAbs to CD3 (panel C = normal skin, panels F/I = AIDS-KS tissue). Immunohistochemistry demonstrated that in both AIDS-KS lesions the atypical spindle cells were CD31+. About 70–80% of the cells in the AIDS-KS tissue was stained with anti-CD31, while only 2–5% was stained in the normal skin (Fig. 1, panel B/E/H). The αCD3 staining showed that in both AIDS-KS tissues the percentage inflammatory cells is low, with a slightly increased staining in KSb, and almost no staining in normal skin (Fig. 1, panel C/F/I). So, overall histological examination suggests that both AIDS-KS tissues are very similar. A total of 130,521 tags were analysed, approximately one third from KSa (45,913 tags), KSb (47,316 tags) and 37,292 tags from NS. Only 2,6%-3,0% of the tags occurred five times or more, 3518, 3444 and 2908 were seen between two and four times, and 11,326, 12,075 and 11373 tags occurred only once (Table 2), respectively. The frequency distribution fits with the overall pattern of gene expression in mammalian cells, wherein only a few percent of mRNA species reaches high copy numbers whereas most transcripts display low levels . Similarities between the global expression profiles of different samples can be readily visualized using scatter plots, and quantified through the calculation of a Pearson correlation coefficient. As expected, both AIDS-KS samples are much more similar to each other than each of them is to normal skin (average correlation coefficient of 0.83 versus 0.68 and 0.63, respectively; figure 2). Scatterplot analysis of SAGE libraries Scatterplots of KSa versus KSb (A), KSa versus normal skin NS (B) and KSb versus NS (C) were generated using the SAS version 6.12 software. The tag frequency for each (per 50,000) is plotted on a logarithmic scale for KSa and KSb. The Pearson correlation coefficient of each comparison was calculated. So, based on histological staining, tag frequency distribution and comparison of gene expression profiles, we concluded that both AIDS-KS tissues are very similar and have similar mRNA expression profiles. The presence of HHV8 DNA in the two AIDS-KS lesions was tested with a nested HHV8 PCR . Both AIDS-KS lesions were HHV8 DNA positive (data not shown) and also expressed HHV8 RNA. HHV8 specific tags found in the two SAGE libraries are presented in Table 3. The finding of tags corresponding to T1.1 and T0.7 transcripts agrees well with the observation that these two transcripts represent the bulk of the virus-specific RNA extracted from AIDS-KS tumours . HIV-1 RT PCR confirmed the presence of HIV-1 RNA in both lesions (data not shown). HHV8 tag counts in the AIDS-KS SAGE libraries For comparison tag numbers for each group were normalized to 50,000. Early KS is a reactive process of polyclonal nature, where lesion development is induced by immune dysregulation and production of inflammatory cytokines. In later stages, KS can then progress into a true sarcoma. KS lesions are composed of endothelial cells (or better: spindle-shaped cells with both endothelial and macrophage characteristics), and a large infiltrate of inflammatory cells. Both our patient samples represent advanced stage nodular KS. At that stage, inflammatory cells are less prominent. To compare gene expression in KS with gene expression in other cell types and with other cancers, Pearson correlation coefficients were calculated for KS SAGE libraries and publicly available libraries (Table 4). From Table 4 it is obvious that KS does not highly resemble pure endothelial cells as measured by gene expression profiles (see the comparison with the two HMVEC libraries, one of which has been stimulated with VEGF). A better correlation was observed when KS was compared with a leukocyte library (CD4) , but interestingly the highest correlation coefficient was found when KS was compared to a combined library of VEGF-stimulated endothelial cells and leukocytes, suggesting that the description of a KS lesion as a mixture of (aberrant) endothelial cells and an inflammatory infiltrate is reflected in the gene expression profile. Gene expression in KS does not bear close resemblance to other types of cancer, as correlation coefficients with several cancer types were always low (≤ 0.50, range= 0.21 for pancreas cancer to 0.50 for prostate cancer). Many features of normal skin gene expression are still preserved in our KS samples (correlation coefficient = 0.66), suggesting that normal skin can be used as a control material. Brain (normal), colon cancer, ovary cancer, pancreas cancer, prostate cancer, etc. In an effort to identify potential molecular markers for AIDS-KS we combined the SAGE libraries of the two AIDS-KS tissues and compared this pooled SAGE library with a SAGE library generated from pooled samples of three different normal skin biopsies. Comparison with normal skin was done essentially to be able to subtract genes specifically expressed in (normal) epidermis, and of remnants of normal skin expression in the AIDS-KS biopsies. Subtraction should then result in transcripts specific for AIDS-KS spindle cells and the associated inflammatory cell population. Table 5 shows transcripts that were overexpressed in AIDS-KS compared with normal skin tissue, while Table 6 shows transcripts overexpressed in normal skin compared with AIDS-KS. Overall, the pattern of expressed genes in KS shows a reflection of an active process in the skin, including transcripts from matrix remodelling genes (matrix proteases and collagens), angiogenesis-associated genes, and immune response genes. Among the most abundant transcripts expressed in AIDS-KS are: collagen type IV α1, basement membrane collagen, and VE-cadherin, a vascular endothelial cell marker associated with intercellular junctions. VE-cadherin expression by KS spindle cells has been reported before . Collagen type VI α3, a pan endothelial cell marker associated with angiogenesis , is highly expressed, as is Thy-1, a cell surface antigen, reported to be especially elevated in tumour endothelium . In Table 7 a comparison of the KS library with (tumour) endothelial markers described by St. Croix et al. is presented. Many tags expressed by colon (tumour) endothelium are also present in the KS libraries, albeit generally at lower tag numbers, suggesting that KS endothelial cells have an expression pattern similar to colon (tumour) endothelium. The KS libraries were not generated from purified endothelial tissue, as were the libraries from St. Croix et al., hence the lower tag numbers. Remarkable is the complete absence of the endothelial marker CD146 (Mel-CAM) from the KS libraries. Novel tumour endothelial markers identified by St. Croix et al. (TEM1-9) are only partially expressed in KS, and most of them are thus likely colon specific (Table 7). Endothelial markers expressed in normal and tumour endothelial cells (ECs) and in KS. For comparison tag numbers for each group were normalized to 100,000 transcripts. Endothelial markers were derived from . Tumour endothelial markers derived from colon cancer endothelium are shown in bold. Keratins 1, 5, 10 (Table 6), and galectin 7 (52 tags in KS, 63 tags in NS) were expressed in both AIDS-KS and NS libraries, both of which contain epidermal tissue. A SAGE study of isolated human epidermal tissue confirmed that these three genes are highly expressed in the epidermis . Keratin 16 was significantly upregulated in the AIDS-KS lesions, and was absent from normal skin (Table 5). Keratins 6b, 16 and 17 are in vivo usually seen following stress and during hyperproliferation. Annexin 1 was identified as a gene severely downregulated in AIDS-KS (Table 6). The gene product belongs to a family of Ca (2+) dependent phospholipid binding proteins, and has possible anti-inflammatory activity . Cyclin D1 is also downregulated in AIDS-KS, which is suggestive of disturbance of normal cell cycle control. Downregulation of D-type cyclins is often observed in cancer, including those of viral origin (see ref. ). The HHV8-encoded viral cyclin D gene (v-cyc D) could then act as a substitute for the loss of cellular cyclin D1, as it is able to interact with a similar, but not identical set of proteins, resulting in aberrant cell-cycle progression . One of our goals was to find transcripts that could be used as novel prognostic markers for AIDS-KS, preferably measurable in blood. Cells with characteristics of endothelial macrophages are present in blood and lesions of AIDS-KS patients [9, 10]. We focused on transcripts of adhesion molecules, secreted proteins or molecules displayed on the cell surface. Six genes were finally selected based on upregulated expression in our SAGE libraries: psoriasin, small inducible cytokine subfamily A member 18, interleukin 1 receptor, dual specificity phosphatase 1, sialoadhesin and Tie 1 (Table 5). Psoriasin is a S100 calcium-binding protein, which is chemotactic for CD4+ T lymphocytes and neutrophils, and has been implicated in inflammatory skin diseases like psoriasis . Cytokine A18 is a chemokine with a preferential activity for T-lymphocytes . The interleukin 1 receptor is involved in regulation of inflammatory processes, and as such of interest in KS as inflammation is an important aspect of the disease. Dual specificity phosphatase 1 is a non-receptor type phosphatase that is highly inducible by oxidative stress and heat shock in human skin cells . It is thought to play an important regulatory role in the human cellular response to environmental stress. Sialoadhesin, a lectin-like sialic acid-binding receptor, is expressed on macrophages in a regulated fashion, with high levels on subsets of macrophages. For example, macrophages present in the perifollicular zones of lymphoid tissues express sialoadhesin  which mediates interactions with lymphocytes . Finally, the Tie receptors are required for angiogenic remodelling and vessel stabilization that occurs subsequent to the initial vasculogenic actions of VEGFR-1 and VEGFR-2 . To verify the increased expression of these six genes, we first confirmed tag identity by a method described earlier , using the two original AIDS-KS poly(A) mRNA isolations. Sequence analysis confirmed that the tag sequences indeed belonged to the genes identified by tag analysis. Then, we used the limited-dilution reverse transcription- (RT-) PCR technique with gene-specific primers to analyse the expression in five additional AIDS-KS lesions and two normal skin biopsies. As shown in figure 3, the semi-quantitative PCR confirmed the higher expression levels of five of the six selected genes. However, only Tie 1 was significantly upregulated in AIDS-KS tumour tissue compared with normal skin (p < 0.05 student t-test). Sialoadhesin/CD169 mRNA was found to be elevated in tumour tissue, but the significance of this finding was low (p > 0.1) due to a substantial standard deviation in the measurements. However, due to the semi-quantitative nature of the RT-PCR used it is possible that expression level differences have been underestimated. Semi-quantitative RT-PCR analysis of differentially expressed genes PCR-analysis was performed for six genes on cDNA generated from normal skin tissues or different AIDS-KS tissues. Expression level indicated the 10-fold dilution step starting with 500 ng total RNA/DNase treated. Error bars are shown. * P < 0.05. Antibodies to sialoadhesin/CD169 are commercially available, and were used for histological examination of AIDS-KS biopsies (Fig. 4). Cells staining positive for anti-CD169 were identified as tissue macrophages. To confirm their identity, slides were also stained with anti-CD68 antibodies. CD68 is a transmembrane glycoprotein that is highly expressed by monocytes and macrophages. 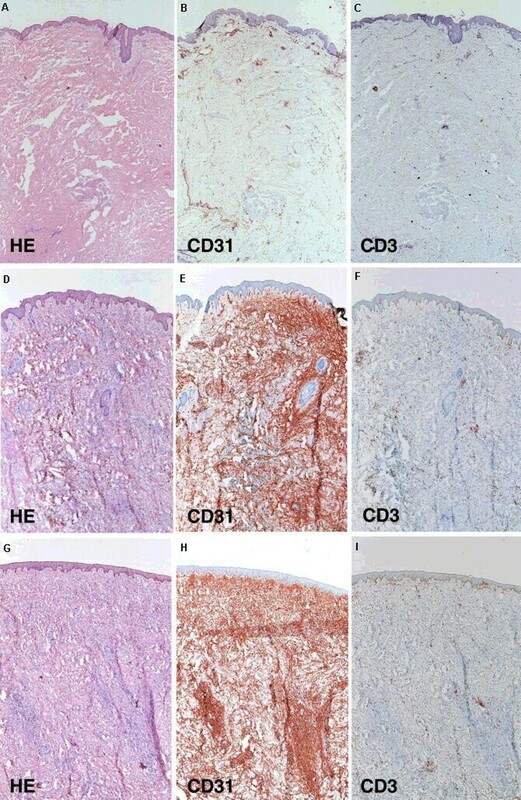 Indeed, in consecutive tissue sections, cells with macrophage-like morphology stained with the anti-CD169 and with the anti-CD68 antibodies (Fig. 4). Photomicrographs of anti-CD68 and anti-CD169 stained sections of selected tissues The two frozen skin biopsies show a similar histopathological picture of nodular stage Kaposi's sarcoma. Left panels (A/D): HE staining; middle panels (B/E): αCD68 staining; Right panels (C/F): αCD169 staining. Throughout the dermis, vascular proliferations are found surrounded by irregular, rather dense areas of atypical spindle cell proliferations. Both lesions contain sparse inflammatory cell infiltrates, mainly consisting of CD68+ macrophages. Both AIDS-KS libraries were found to express HHV8 RNA. The detection of relatively low tag counts for HHV8 specific ORF's can be explained by only a low percentage of cells expressing HHV8 RNA. The viral T1.1 and T0.7 transcripts are the predominant viral transcripts found in AIDS-KS tumours  and in primary effusion lymphoma (PEL) , another disease associated with HHV8. Recently, the global HHV8 genome expression of two PEL cell lines was studied using viral micro-arrays [34, 35]. A good correlation between the kinetic behaviour of viral genes in cultured PEL cells and the transcription patterns observed in AIDS-KS biopsies has been observed . The pattern of gene expression concurred with the functional roles of the viral genes. Transcripts corresponding to ORF K4.2, 18 and 59 were simultaneously expressed in induced PEL cells and were all classified as secondary lytic genes. We detected in our SAGE libraries only tags belonging to the five HHV8 ORF's mentioned before, suggesting that these genes are expressed at significantly higher levels than the other HHV8 genes. HHV8 contains many polycistronic mRNAs, where expression of the 5' ORF cannot be detected using SAGE. However, as transcription of both ORF's is coupled, we do not think that this problem interferes with our SAGE analysis, as detecting tags for a downstream ORF should indicate that the upstream ORF is also expressed. In an earlier study, Poole et al. presented changes in gene expression of cultured dermal microvascular endothelial cells after HHV8 infection as measured by micro-array screening. A total of 14 genes were subsequently confirmed by real-time PCR to be upregulated. Six of these, calgranulin B, CD14, RDC1, TGF-β3, TIMP1 and von Willebrand factor, also showed increased tag numbers in our in vivo analysis of AIDS-KS. However, cell lines have in general proven to be quite different from primary cells in their gene expression profile . Earlier, immunohistochemistry showed that KS spindle cells in tissue stain positive for CD14 and von Willebrand factor . Vascular endothelial growth factor (VEGF) is one of the most important agonists of angiogenesis. It is a secreted protein that induces vascular permeability and endothelial cell proliferation. The spindle cells of primary AIDS-KS lesions express and secrete VEGF . The most abundant differentially expressed tag in AIDS-KS represents collagen type IV α1, a gene induced by VEGF, emphasizing the importance of VEGF in AIDS-KS development. However, tags for VEGF, VEGF-B, VEGF-C, and VEGF-D were absent or nearly absent from libraries KSa and KSb, as were tags for platelet-derived growth factors (PDGFα/β and PDGF-C), and fibroblast growth factor 4, sometimes referred to as the KS oncogene . Tags representing endothelial VEGF receptors, namely VEGFR-1, VEGFR-2 and VEGFR-3, were not found amongst the most abundant differentially expressed genes (Table 5), confirming an earlier in vitro study . However, Tie-1 receptor mRNA, belonging to another subfamily of VEGFR receptors, was increased in AIDS-KS. The ligand for Tie1 remains as yet to be identified. Interestingly, the activating ligand for Tie-2, angiopoetin-4, was detected in both AIDS-KS libraries. These results partly confirm the in situ hybridisation work of Brown et al  that showed expression of angiopoietin-2, Tie-1 and Tie-2 in the spindle cells of AIDS-KS. Among the most abundantly expressed tags in AIDS-KS are the S100 calcium-binding proteins, S100A7/psoriasin, and S100A9/calgranulin B. S100 proteins have been implicated in diverse cellular processes including cell proliferation, apoptosis, differentiation, invasion and metastasis . Psoriasin was originally identified as a protein whose levels are increased in psoriatic keratinocytes . Subsequently, psoriasin was also found to be upregulated in abnormally differentiating primary keratinocytes, in squamous carcinomas  and in a subset of oestrogen-receptor negative tumours . Our KS tissues exhibit several similarities with psoriatic skin, probably reflecting a common hyperproliferative or inflammatory process. Firstly, we observed an altered terminal differentiation of keratinocytes as indicated by the aberrant expression of keratins. Secondly, in AIDS-KS the capillary loops extend into the dermal papillae, and are in close proximity with the epidermis, a characteristic also observed in psoriasis. Thirdly, there is high expression of psoriasin in our SAGE AIDS-KS libraries. Calgranulin B is expressed by macrophages in acutely inflamed tissues and in chronic inflammation , and is also induced in epithelial cells during dermatoses. An upregulation of keratin 16 in AIDS-KS was observed. A strong induction of keratin 16 occurs after physical injury to the human epidermis and is an active part of the epidermal response to wound healing. Keratin 16 is also abundant in many hyperproliferative disorders, including psoriasis, lamellar ichthyosis and chronic irritant dermatitis [46–48]. 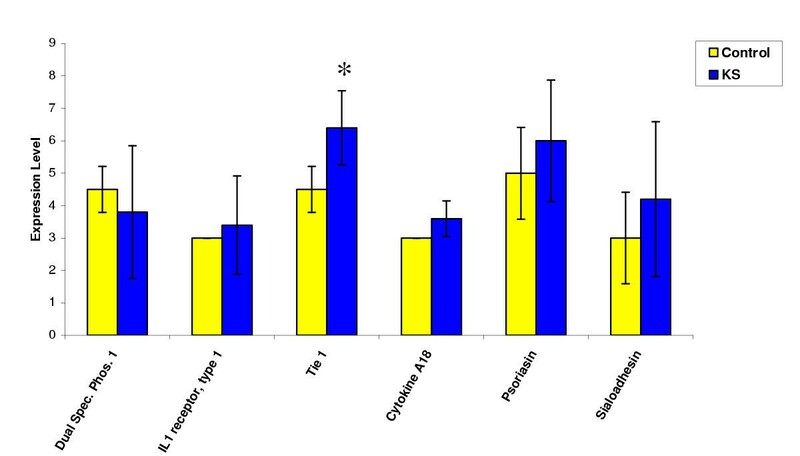 Expression of epidermal keratins 1, 5, and 10 was lower in KS than in normal skin (Table 6), suggesting that epidermal gene expression is also affected. Sialoadhesin/CD169 is a 1709aa macrophage-restricted membrane glycoprotein, a prototypical member of the Siglec family of sialic acid binding immunoglobulin (Ig)-like lectins, which are involved in cellular interactions . Macrophages express multiple receptors found also on other leukocytes. Only a restricted few are exclusively assigned to macrophages and are hence implicated in specific macrophage functions. Sialoadhesin/CD169, or siglec-1, is one such receptor, which is particularly found on activated macrophages in chronic inflammation and tumours. Recently, it has been suggested that sialoadhesin contributes to cell-cell and cell-matrix interactions of macrophages during inflammatory reactions . Antibodies to sialoadhesin specifically stained tumour macrophages in different AIDS-KS biopsies. Cells that stained positive for CD169 were morphologically identical to cells that stained with anti-CD68 antibodies in consecutive tissue sections, confirming their identity as macrophages. HHV8 is known to replicate in monocytes/macrophages found in KS lesions [5, 49], so these types of cells may contribute significantly to the transmission of the virus and to the increase of the HHV8 load generally observed in late stages of the disease [50, 51]. The finding of an increased expression of sialoadhesin in PBMC of AIDS-KS patients (unpublished observation) suggests that the stained macrophages in KS lesions are recruited from the circulation rather than produced locally. This hypothesis is strengthened by the fact that peripheral blood cells of KS patients contain macrophage-related cells that can differentiate in culture into adherent spindle cells [21, 52]. This manuscript describes the SAGE analysis of normal skin versus AIDS-KS skin tissue and revealed that several genes are aberrantly expressed in AIDS-KS. Focusing on transcripts overexpressed in AIDS-KS, we showed that Tie1 is elevated in AIDS-KS tissue. Besides, we identified a new marker of AIDS-KS, sialoadhesin. Sialoadhesin/CD169 is highly expressed by subsets of macrophages, namely those present in the perifollicular zones of lymph nodes and spleen, in macrophages of the liver (including Kuppfer cells), lamina propia macrophages of the colon, perivascular macrophages of the brain, and alveolar and interstitial macrophages of the lung. CD169 expression is also found on activated macrophages in chronic inflammation and tumours. Kaposi's sarcoma is characterized by the simultaneous emergence of multiple lesions. Our findings suggest that activated sialoadhesin-expressing macrophages may play a role in this process, as hypothesized earlier by Ensoli et al. . The clinical value of sialoadhesin expression is currently being evaluated in our cohort of HIV infected patients. M Cornelissen and AC van der Kuyl contributed equally to this work. We thank Gerrit-Jan Weverling for help with the scatterplot analysis, Audrey van der Schoot, John Dekker, Jolanda Maas, Abeltje Polstra and Xianghong Chen for help with sequencing, Bert Tigges for tissue preparation, Jos Mulder for immunostaining and Wilfried Meun for help with photography. Financial support to generate the KS SAGE libraries was obtained from Primagen BV (Amsterdam, The Netherlands). Authors 1 and 2 [MC, ACvdK] conceived, designed, coordinated and analysed the study, and drafted the manuscript, author 3 [RvdB] constructed the SAGE libraries, author 4 [FZ] performed the RT-PCRs, author 5 [CJMvN] performed the histological analyses, and author 6 [JG] was head of the department at the time of the study.